“Excellent.” He brought me a cup of black coffee, almost espresso, with no cream or sugar. I found myself strangely enjoying it. It didn’t taste good— it simply was good. I had been missing the point all along. Coffee isn’t a drink like soda or orange juice, it’s a ritual: it comes in small cups that you warm your hands on and sip slowly— meditation with a touch of caffeine. My wife and I are now learning how to make good coffee at home (mine black and hers with cream), since it’s hard to pop over to Europe for a cup. 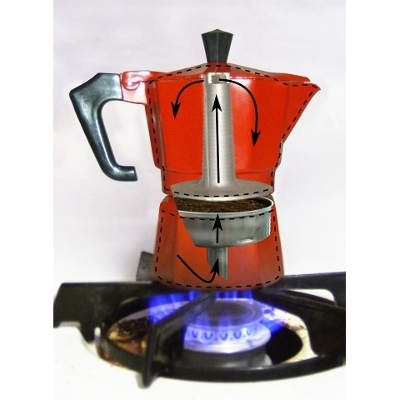 The two best methods that we’ve found don’t require any expensive machines; just a French press for coffee and a moka pot for espresso (pictured above). The process of making coffee or espresso focuses one’s attention on so many physical details— sinking the scooper into a can of hard beans, the smell of grinding coffee, dusting the grounds off of the blades, tamping them into the pot like a bed of loose soil, listening for the gurgling to keep the now-empty pot from burning— this intent focus on the specifics of reality is, I believe, the soul of physics. Many of the major breakthroughs in physics started as a fascination with the way some little thing behaves. That fascination led to tinkering, the tinkering led to controlled experiments, the experiments led to facts, and facts have the power to fundamentally change our outlook on the world. Consider the mushroom-like plumes that cream makes when poured into hot coffee. Something special is happening: first, the cream floats up and pushes against the coffee, then changes somehow by the heat and reverses; the coffee pushes against the cream, leaving tendrils of black and white that twist and intertwine until the whole liquid becomes a smooth mocha brown. Some interaction of viscosity, temperature gradients, and maybe even surface tension might explain it, but the first reaction is, “Wow— look at that!” An artist would draw it. A physicist tries to reproduce it in the lab. 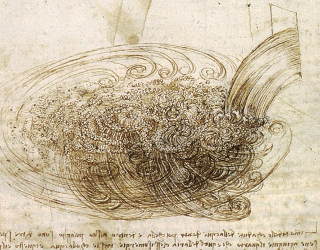 Water pouring into a pond, by Leonardo da Vinci. When Leonardo da Vinci observed the patterns made by flowing water, he was inspired to draw the sketch shown on the right. In the accompanying text, he described the patterns as being “like hair,” with the main current being the weight of the hair and the eddying motions like curls. The artistic practice of “seeing,” that is, rendering something as you really see it, rather than as you expect it to be, is also the aim of science. Centuries later, da Vinci’s curls became known as vortices, and the pattern of eddying flow is called turbulence in fluid dynamics. The picture below and to the left is from an experiment with turbulence. A thin film of soap pours from the top of the picture to the bottom of the picture, and it flows past a moving paddle on the top. Although the knowledge gained from experiments like this can be used to design faster boats and airplanes, it was motivated by watching fish. Fish make these patterns as they swim through water; the scientist wanted to find out how the precise motion of the fish (modeled by the paddle) affects the eddy currents it leaves in its wake. The picture on the right was taken by an astronaut, through a window on the space shuttle. The same pattern of repeating curls can be seen in clouds over the Atlantic Ocean, miles from one end to the other. Left: vortices produced in a laboratory. 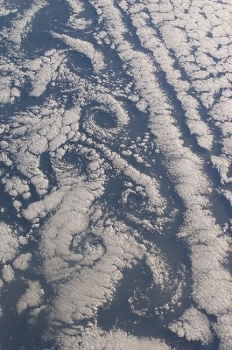 Right: similar patterns in clouds seen from space. By far the most amazing vortices that I’ve ever seen are the vortices in superfluids. Some liquids, when chilled to nearly absolute zero temperature (−460°F), dramatically change into a new state of matter with weird properties. This state of matter is called “superfluid” by analogy with the similar phenomenon of superconductivity, and it is one of the few manifestations of quantum mechanics that is large enough to see with human eyes. Superfluids do things that are unsettlingly perfect— perfectly smooth, zero viscosity, infinite thermal conductivity— like a mathematical idealization in real life. 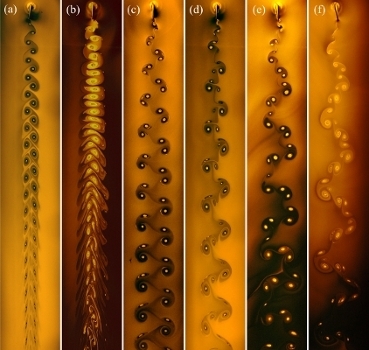 Pictures of quantized vortices in a superfluid, photographed from above. (Yarmchuk, Gordon, and Packard, Observation of Stationary Vortex Arrays in Rotating Superfluid Helium, 1979). One of the weird properties of a superfluid is that it cannot be rotated. Think about that for a moment. If somebody told me that an object cannot be rotated, I’d say, “Watch this,” as I grab the thing and spin it by hand. When you try that with a bucket of superfluid, it reacts by forming vortices to exactly cancel the rotation of the bucket, thus preserving zero overall rotation. The diagram and photographs below the video are from an experiment to see if that really is how it works. Look closely at the photographs. The dots are the tops of little tornado-like vortices in the superfluid. As the scientists increased the rotation speed of the bucket, new vortices appeared, one by one, and arranged themselves into a regular pattern. Each vortex has exactly one “quantum unit” of spin. The vortex cannot rotate any faster or any slower than this unit; the exact rotation rate is a fundamental constant of the universe. 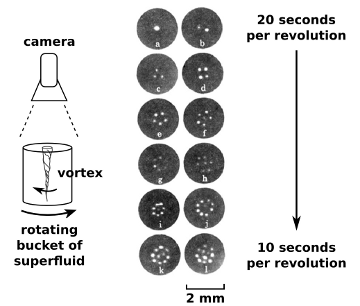 If we spin the bucket faster, the superfluid simply makes more vortices. There is a deep analogy between these vortices and fundamental particles, such as electrons and quarks inside of atoms. An electron contains exactly one quantum of electronic energy in the same way that a superfluid vortex contains one quantum of rotation. When enough energy is present, two electrons may spontaneously form, or three, but never two and a half, just like the vortices. Particles and superfluid vortices are closely related in quantum theory, so much so that studying one can teach us new things about the other. That’s enough musing about cream in a coffee cup for now. This website is a blog about physics, about looking at things closely and seeing how they really are. Sometimes, it will lead to surprising connections. Unlike many blogs, the articles won’t be rushed, and they will stay focused on the central theme. I won’t blog about what I eat for breakfast in the morning, unless of course that yields new insights into the cosmos.